Register now! 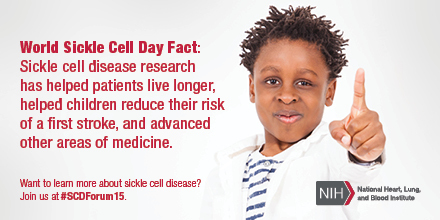 The 2015 Sickle Cell Disease Forum will be held on the NIH Campus in Bethesda, MD. Registration is now open. View the Agenda for the Sickle Cell Forum here. Are you interested in learning more about Sickle Cell? If so, please see the following information from the NIH? In the United States, it’s estimated that sickle cell disease affects 90,000 to 100,000 people, mainly African Americans, and occurs in about 1 out of every 365 African American births. However, worldwide sickle cell disease occurs in people of diverse racial and ethnic origins. The disease is most common in people whose families originate from Africa, South or Central America (especially Panama), Caribbean islands, Mediterranean countries (such as Turkey, Greece, and Italy), India, and Saudi Arabia. About 1 in 13 African Americans are born with sickle cell trait, which occurs when a person inherits one copy of the sickle globin gene from one parent and a normal gene from the other. People who have sickle cell disease inherit two copies of the sickle globin gene—one from each parent. Since people with sickle cell trait don’t have disease symptoms, many people who are carriers are not aware that they have the trait. If sickle cell disease or sickle cell trait runs in your family, you might consider genetic counseling before planning a family. At present, there is no widely-available cure for sickle cell disease although breakthroughs in sickle cell disease research have helped patients live longer. Until the 1970s, the life expectancy in the United States for individuals with sickle cell disease was about 14 years. Today, many individuals live into their 40s, 50s, and longer. Some people have few symptoms, but some live with chronic pain, anemia, lung disease, leg ulcers, and other complications. The National Heart, Lung, and Blood Institute (NHLBI), part of the National Institutes of Health, is supporting research on better treatments to ease the burden of sickle cell disease for those affected. Notable successes due to research include the use of antibiotics to prevent and treat infections (which have reduced childhood deaths from the disease by more than 90 percent), as well as blood screening tests on newborns which are now performed in all U.S. states. Current research finds that bone marrow transplants can cure sickle cell disease in some patients. Find a good doctor and get regular checkups. Often, the best choice is a hematologist (a doctor who specializes in blood diseases) working with a team of specialists. Maintain a healthy lifestyle. Stay active, drink 8-10 glasses of water daily, eat a well-balanced diet, and aim for 7-8 hours of sleep each night. Prevent infections and illness. Stay current on vaccinations, including flu shots, and wash hands often. The drug hydroxyurea has helped some patients reduce their risk of infections. Get support from your family or community. Stay updated on advances in sickle cell disease management. Support groups and community-based organizations can be good options to help you get information and assistance. Interested in learning more? Please join the National Heart, Lung, and Blood Institute (NHLBI) at the National Institutes of Health (NIH) for the Sickle Cell Disease Forum on June 25-26, 2015, in Bethesda, Md. The Forum will include leading sickle cell disease researchers, community members, and advocates sharing issues, challenges, and advancements in sickle cell disease. For more information, visit NHLBI “Engaging the Community: Developing Solutions” Sickle Cell Disease Forum. If you’re unable to attend in-person, you can also join the forum through a webcast. 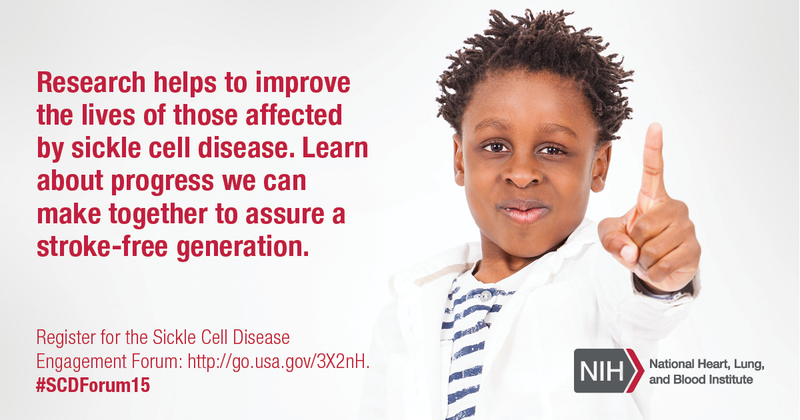 For more information on sickle cell disease, including fact sheets, recent research findings and more, go to NHLBI Sickle Cell Resources and follow the latest on sickle cell disease at NHLBI on Twitter and on Facebook. *The information in this post was provided by the NIH.